Our Dual Vessel Cartridge Unit (TDW) is the most commonly used filter cartridge unit in the oilfield industry. 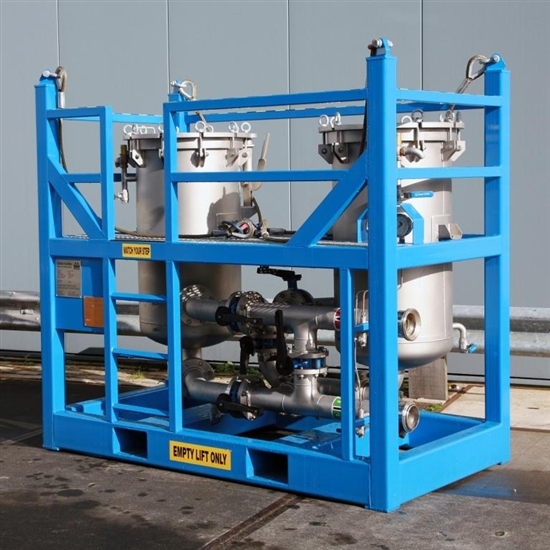 This, offshore proof, skid-mounted filter unit can be supplied as a cartridge, bag or combination unit, equipped with all necessary valves and safety features. Our Dual Vessel Cartridge Unit offers the most cost-effective way to clean-up all possible oilfield fluids. It allows you to simultaneously filter with one vessel and easily change the used cartridges. Standard TDW 610 type: 50 cartridges per vessel. Innovative push lever and swing-away vessel lid, easy to operate. Swing-bolts and nuts for quick opening. Self sealing, service friendly cover gasket. 4" Butterfly Valves (SS-Disk). Easy to operate. Certified hoisting slings lifting lugs and forklift pockets. Safety valve set at 101.5 psi (7bar). Offshore DNV 2.7-1 / EN12079 frame.